Our offices and homes are bound to get dirty one way or another, and we need the right accessories that make the whole cleaning process easy and leave our floors sparkling. With a good mop bucket, you’ll achieve efficiency in cleaning. Features such as the length and strength of the mop handle and material used to make the mop head determine the cleaning services they’ll provide to you. We came up with the best mop bucket review to give you a good grip of these essential features and help you choose one with a whole set of characteristics that fit your cleaning necessities. A good mop bucket will give you a less tedious mopping and a more comfy living. The quality of the O-cedar bucket and mop is top notch. It has a built-in wringer which spins to wring the mop hands free leaving just the right amount of moisture in the mop for cleaning. The spinning of the wringer is activated by a foot pedal which you easily step on to spin the wringer leaving just the right moisture in the mop. Always hold the mop handle loosely for an easy spin. Splash guard keeps the dirty water inside the bucket during wringing barring it from splashing all over you and your floor. The mop handle is impressive as you can adjust it from 24″ up to 51″ with the mop head attached which gives you the freedom to clean even far under your furniture without the need of moving it. The mop head is made up of microfiber which has deep cleaning properties removing all the dirt and stains from your floor. The microfiber used to make the mop head is safe to use on all wood and tile floors. 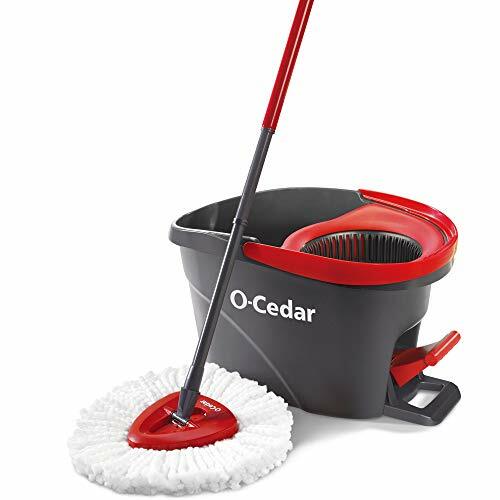 O-Cedar’s mop head has a flexible shape which can fit into corners which are generally hard to clean with regular mops. The mop is multipurpose as you can either use it when dry to dust floors and other surfaces such as your ceiling or when wet to clean up your floor. The mop head is safe to wash using your machine making it reusable for a long it. This professional microfiber mop focuses on durability and ease of cleaning. It comes as a package of one microfiber dust mop pad, two microfiber wet mop pads and a stainless steel mop handle with high quality aluminum frame. The dust mop is designed in a way that it collects both large and small debris from your floor. The dust mop contains electrostatic charge which attracts specks of dust and debris from your floor trapping them within the microfiber. This makes cleaning quite easy and fast. The wet microfiber mop pad is used for deep cleaning. Just wet it and drain any excess water then slide it on your floor to remove any dirt and grime. The microfiber cleans any type of floor including hardwood floors excluding any need to use deep cleaning chemicals. 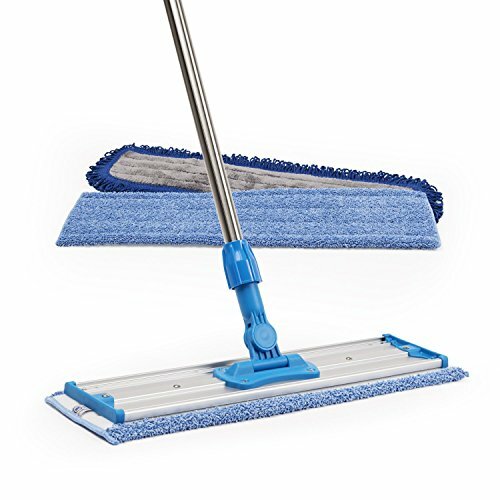 The 18″ mop pad frame allows you to clean larger surfaces at a time and has a 360-degree swivel design for flexible cleaning. This makes cleaning fast and easy. Its mop handle is adjustable up to 70” to fit your height allowing you to mop without bending over and is made of high quality stainless steel. 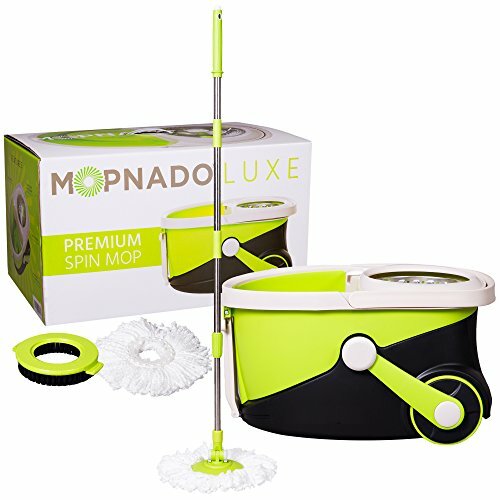 The Mopnado mop and bucket aim at making your cleaning easy with its durable high quality bucket, two 14″ microfiber mop head, and a 14″ scrub brush. The microfiber mop and scrub are suitable for use on any floor which means you don’t have to buy a different type of mop head for each type of floor. 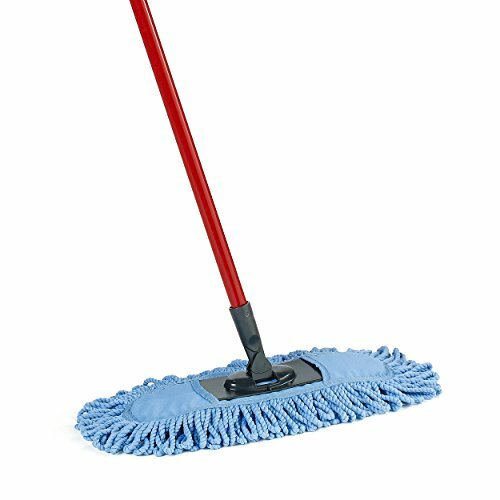 The microfiber mop heads whirl up to 180 degrees making it easy to clean corners and hard to reach places. They’re made of high absorbent microfiber which traps all the dust and debris off your floor. The mop heads are machine washable which makes them reusable even when filled with filth. Another good feature about Mopnado is that the bucket is made of sturdy stainless steel material which increases its durability by tenfold. The bucket has two handles and a pair of wheels for stress-free mobility from one room to another during cleaning. The bucket has an inbuilt wringer which spins to dry the microfiber mop during cleaning. Spinning is activated by gently pressing your mop against the wringer. It features an adjustable mop handle from 47″ to 56″ which allows you to dust windows and ceiling and clean hard to reach places such as under your sofa. The Genuine Joe bucket/wringer is for professional cleaning although it can still be used for home cleaning. 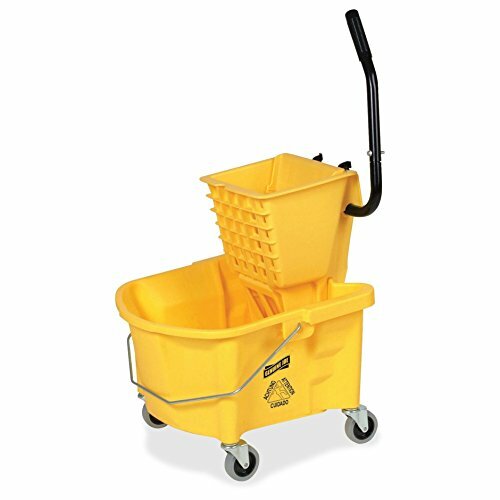 The bucket combines its sturdy design, caution features, and wringer to simplify your work during cleaning. The bucket is made of sturdy plastic web design to increase its strength and hold more water. 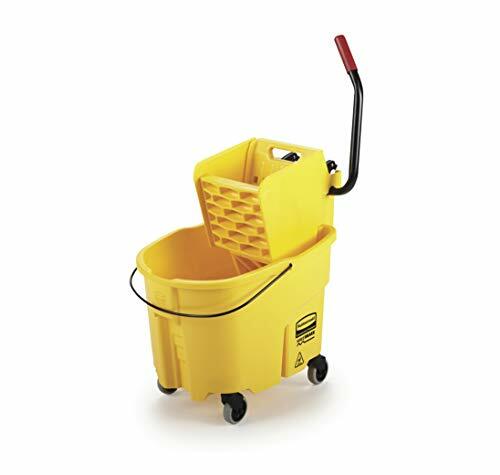 It features two pairs of large wheels and one metallic handle for easy mobility during cleaning. The wringer is wide enough to fit most mops and has a splash guard to prevent backsplash of dirty water. To use the wringer, you place your mop in it and use the stainless steel handle to squeeze the water out of the mop. This makes your work easy when cleaning. The bucket is huge holding up to 6.5 gallons of water and has liter and volume markings which let you know how much water you have in the bucket. It also has a big caution label on the side to let people know that cleaning is in progress and the floor is wet. This keeps them from slipping and getting hurt in the process. The Swiffer cleaner starter pack comes as a pack of 1 Power mop, five cleaning pads, 500ml cleaner Solution and batteries for the spray. This mop is safe to use on all finished floors including hardwood and tiled floors making it a multipurpose spray mop. 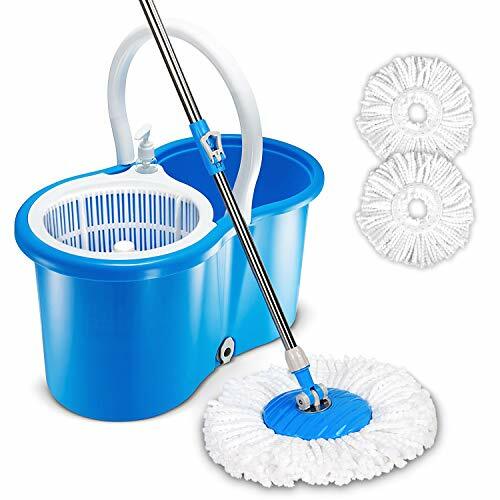 This mop eliminates the need of having a bucket because it holds both the mop head and the cleaning solution. All you have to do is press a button, and the cleaning solution is sprayed in front of the mop head from two powerful nozzles. This spray mop brings convenience in your cleaning life. This mop system contains a reliable cleaning solution which dissolves and loosens up dirt from the floor making cleaning one quick chore. The cleaning pads can absorb dirty filth and lock up debris to avoid it from spreading around as you clean. This makes cleaning easy and leaves all your floors spotless. 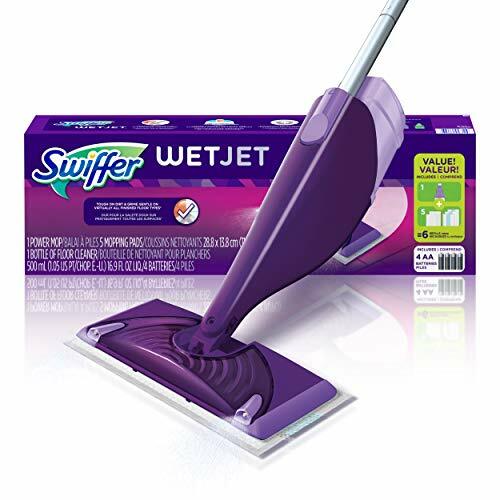 One thing that is worth noting is that the Swiffer WetJet cleaning system cannot be used on waxed or oiled floors and non-sealed tiles because of its powerful cleaning solution. The Spin and Go bucket mop aims at making your cleaning as impeccable as possible as it combines a sturdy bucket and a high quality mop. Spin and Go features a microfiber spin mop for deep cleaning. The microfibers can pick up dirt of the floor by attracting it using the electrostatic charge they generate when gliding on the floor. The microfiber mop also features high absorbent ability to take up any mess off your floor. This mop makes cleaning easy and leaves your floor sparkling. The mop can also be used when dry to dust your windows and ceiling. The bucket is made of high quality material which is strong and durable. It features a wringer that works using spin cycle technology which makes it easier to dry your mop than a foot pedal mechanism. Just place the mop and push to activate the spinner. This makes your cleaning super easy. The Spin and Go is perfect for cleaning corners and hard to reach places because of the mop’s ergonomic design. Rubbermaid combines bucket and wringer in one system to make your cleaning as efficient as possible. The system features highly sturdy and durable materials. The WaveBrake bucket is made from web molded plastic which is very durable. This enables the bucket to handle large amounts of water and dirt without any worries of breakage or cracking. The bucket has wave brake technology which reduces splashing by up to 40% keeping your workplace safer. Integration of calibrations lets you measure the amount of water or cleaning solutions that you want to use during cleaning. Its casters are of high quality and do not leave any markings on the floor as you move the bucket around. They make the Rubbermaid mobile and efficient to use. The wringer features a side press handle which is easy to use. The handle is made of high quality steel for an easy press and durability. The wringer fits most mops which give you the freedom to use any mop that you have or prefer. It has a splash guard to ensure that the water doesn’t splash back on the floor or you. The bucket makes cleaning a relaxed job. O-Cedar dual-action dust mop is made of chenille and microfiber to increase its dusting capabilities. It has a flexible microfiber mop head which makes it adaptable to clean hard to reach places such as under the furniture and corners. The materials used to make this mop are dense to pick up and trap dust preventing it from being spread around as you dust. This makes your cleaning efficient and comfortable. Its handle is long enough to dust your windows and ceiling. The mop is also machine washable which makes it reusable and eco-friendly saving you money. It’s versatile in that you can safely use it on all types of floors. 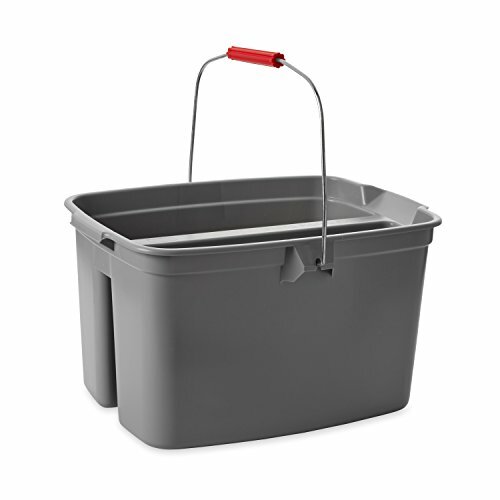 The Rubbermaid double pail is composed of high quality plastic material which makes it strong and durable for your use. It has a sturdy stainless steel handle which helps to move the bucket around. It has a capacity of 19 Quart. The bucket has two compartments, i.e., one for dirty water and one for clean rinsing water. This makes cleaning easy as you can drain your mop’s dirty water and rinse it using clean water in the same bucket. Apart from holding cleaning water, the bucket can be used to carry around bottled cleaning essentials such as detergents which make its use flexible. Hapinnex mop and bucket comes as a combination of flexibility and durability both aimed at making your cleaning easy. The Hapinnex bucket is made up of robust plastic which means that it’s highly durable and will give you service for a long time. It has a hand push wringer which dries the mop up to required moisture level giving you a great cleaning experience. Simply push the mop into the wringer, and it gives it a spin draining the dirty water. The super microfiber mop head cleans better because it can absorb all dirt and grime off your floor. This makes your floor cleaner and your work easier. The mop handle is composed of stainless steel material which is strong and durable. It’s also adjustable between 36″ to 47″ to fit with your height during cleaning and to reach hard to clean places such as under the furniture. The mop rotates at a 360-degree angle to make your cleaning effortless and fast. The mop has a wide cleaning range of up to 14” for faster and extensive cleaning at a go. Hapinnex bucket has two handles for easier mobility when cleaning which makes it flexible to use. The handles are strong enough to carry the bucket even when it’s full of water. A). Capacity: The capacity of the bucket you acquire matters because it will determine the amount of cleaning solution you will hold. If you’re using the bucket for small home cleaning, buy something small and portable but if you’re a professional cleaner purchase something with a more significant capacity for more adjustability. The mop should also have a high water holding capacity for more dirty water absorption. B). Material: the material of the item you purchase and its durability go hand in hand. Buy a bucket with durable material to avoid breakage and leaking. The mop handle should be sturdy and able to handle intense cleaning. The material used to make the mop should feature excellent quality with high absorption and dirt holding capacity. The best material for a mop head is microfiber because it has deep cleaning ability and more absorption of dirt. C). Design: design includes features such as a hands-free wringer and wheels. A good bucket and mop should have a design that makes your cleaning easier. For example, a mop handle that extends to give you more reach is always better. D). Ease of use: a mop and bucket that is easy to use always facilitates to your cleaning. For instance, an easily changeable mop head is better, and a bucket with wheels is easier to move from one room to another during cleaning. What’s the advantage of microfiber over cotton mop? Should my bucket have a wringer? It is not a must for your bucket to have a wringer, but a wringer makes cleaning easier. Inbuilt wringer helps you drain dirty water and rinse your mop hands-free. We, therefore, recommend that you get a bucket with a wringer. What’s the difference between a foot peddle wringer and a hand spinner? For a foot wringer, you have to press the foot pedal every time you want to squeeze dirty off your mop. For a hand wringer, you merely push the mop against the wringer, and it spins to dry your mop. How often should I change my mop head? A microfiber mop head lasts for about six to twelve months depending on the intensity of your cleaning. The good thing about most microfiber mop heads is that they are machine washable which increases their durability. Therefore, if you have a good quality microfiber mop, you can change it after every six to twelve months. Having the right mop bucket is important because cleaning is a daily chore. The above-listed mops and buckets are a good range to choose from because they have exclusive features which make cleaning a fast and easy task. No matter the imperfections they may have, their features and benefits to you will have more significant results. Always choose a mop and bucket that suits your needs bests and a versatile one. We hope that by the end of this review you were able to decide on the one to buy based on all the features of each item.